Up to 180 cm. Most specimen stay smaller and only reach a length from about 120 cm. Some authors describe them with a maximum length of 200 cm. Distribution area: Southern Thailand south of Krabi. In the RED DATA BOOK about the status of mammals, reptiles and amphibians of Thailand also Nakhon Ratchasima (Pak Chong, Wang Namkieo)is listed as a locality. Also TRUTNAU (Ungiftige Schlangen Bd 1/2) remarks, that he has found this specimen in Central Thailand in the Khao Yai Nationalpark. This would be an isolated occurance – at least at the present stage of knowledge – as this locality is about 1000 km northeast from the next locality where this specimen is found. 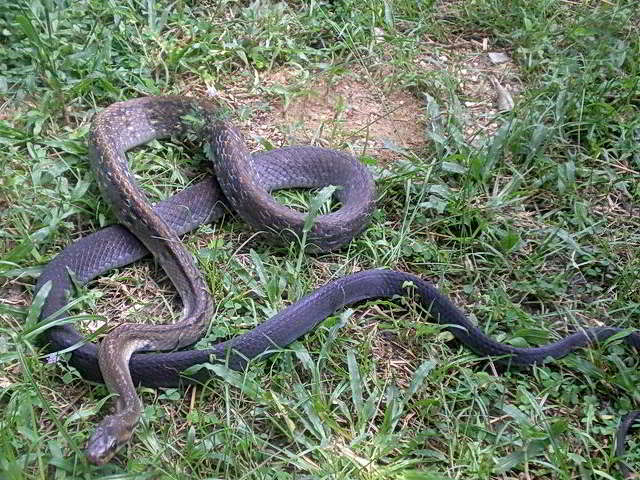 Photos from specimen from this locality would be helpful for to check how far North this snakes lives. Behaviour/habitat: The Black tail Racer mostly inhabits the lowland up to 900 meters above sea level. It inhabits rainforests, bushy areas as well as rice fields and grasslands. 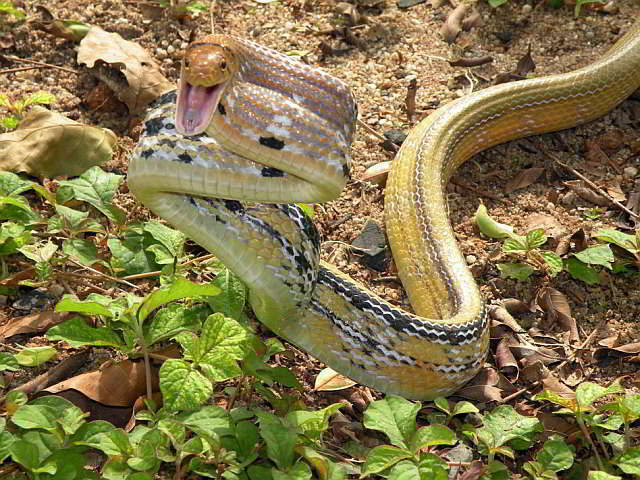 The snake is active during the day and at night. They feed on rodents, birds lizards, bats and frogs. This snake lays eggs. Between 5 and 12 eggs are deposit by the female several times per year. The incubation time lasts between 75 and 89 days. The hatchlings have a total length between 25 and 30 cm at birth. Danger level: This is a nonvenomous snake. In contrary to the alike looking Copperheaded Racer (Coelognathus radiatus) Coelognathus flavolineatus doesn’t tend to bite, even if it picked up by hand. Length: Up to 230 cm. Distribution area: The Copperhead Rat Snake is found throughout Thailand. Danger level: None. This snake is non-venomous.